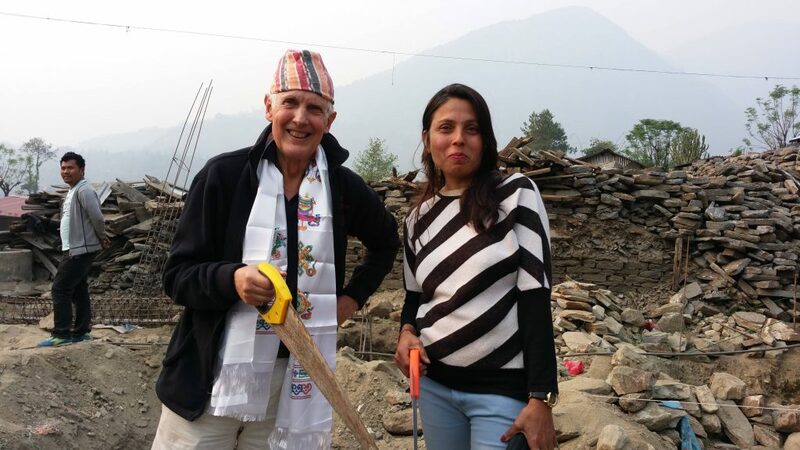 Our CEO continued his visit to Nepal where he saw first hand the work being done by our local teams to help rebuild schools. Catch up on the story so far if you’ve missed Part 1. As the day wore on we gained height on our way to Tartong. Here the school had been totally destroyed and the land where it stood, so badly crevassed that the villagers had no option but to move the school to a different site a mile away. When we arrived up the twisting, turning mountain track, we found our local team of twenty builders fully engaged alongside a huge digger. The entire summit of the hill was being removed to make space for the classrooms and playground. An immense task compared with the normal building programmes of the past. An overnight stay was a welcome and enjoyable break after the rigours of the jeep travel. We stayed in a house built using corrugated iron sheet but still maintaining the traditional Nepali stove in the main room, its chimney rising through the ceiling. We ate daal baht with the family, just as if nothing had happened. The people are incredibly courageous, just rebuilding their lives from nothing and getting on as before. A three-hour walk next morning saw us drop 2,000 metres to the valley floor where, with aching thighs, we picked up the jeep to take us to Timbu. 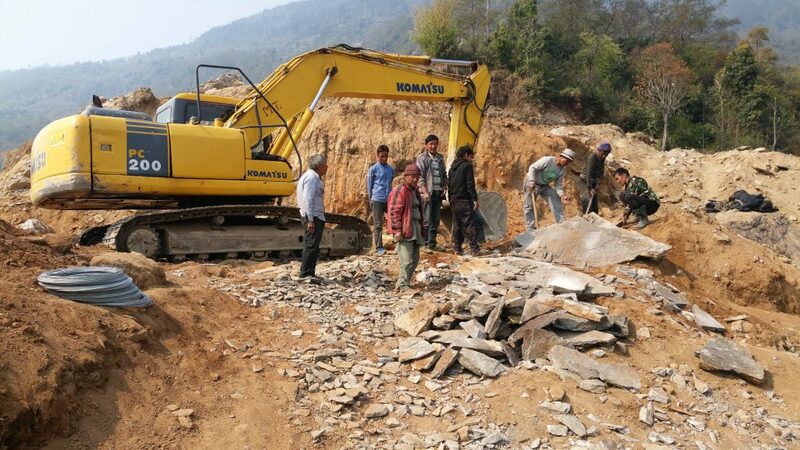 Here, in contrast to Tartong, we have a much more straightforward task on our hands: clearing the bricks and debris and then laying out the foundations to build a new set of classrooms. The engineer and supervisor met us and will bring a team of builders in at the start of next week. On to Nurbuling School, one of our most successful ventures where the original Primary school has been elevated to Lower Secondary with a new boarding hostel being built for girls. We inspected the site, where substantial foundations had already been put in place. The building should be up in a couple of weeks and then we can start fitting out. The spruce young teachers who had recently joined the staff made welcome speeches and we all stood silently to remember the inspirational headteacher who had tragically died in the earthquake. This school is really humming and we expect it to be awarded full Secondary status within a couple of years. Finally to Nakote, where the village suffered terrible damage. Our Country Manager’s mother very nearly lost her life when her house collapsed in a pile of rubble. She had gone outside one minute earlier when she heard her cow making unexpected and alarmed noises. They say that animals feel the signs of quakes before humans. The school mainly survived but suffered serious cracks. 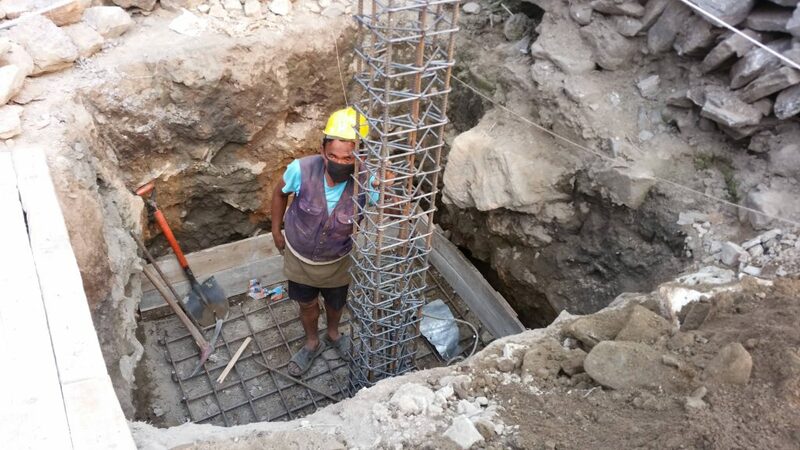 At the request of the Nepal Department of Education, we are retrofitting wall buttresses and roof strengtheners; a big job involving a team of ten builders. At the same time, we have rebuilt the toilet block and hopefully the school will be ready for reopening by mid-April. Next day, we are off to the adjacent valley to the township where one of our largest schools is located, Gunsa. Terrible damage happened here and the house where we stayed on our last visit in 2014 was totally destroyed. Over one hundred people died here, including 30 children. Tales of extraordinary resilience emerge; the child who survived two days buried in ruins and was brought out alive and is now back at school, for example. The school is doing well. The Temporary Classrooms we built last summer are robust and useful, and should last. Fortunately the main school which we built two years ago, has survived the worst of the earthquake but we are retrofitting eight classrooms so they are up to the latest specifications. Alongside them we are building eight new classrooms to the highest earthquake specs and it was good to see the foundations in place. The engineering supervisor here is a woman, quite a rarity in Nepal senior building management. She showed us CAD versions of the new classrooms on her laptop, which seemed an amazing leap of technology for this very rural part of the Helambu region! If you’ve enjoyed this, check out the next chapter!